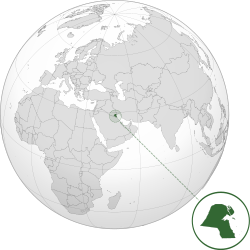 Kuwait (A-la-pek-gí: دولة الكويت), Sai-lâm-a ê kok-ka, oá Pho-su-oan. Thong-lâng-chāi ê chio̍h-iû chhut-sán-kok. ↑ "Population of Kuwait". Kuwait Government Online. 2013. goân-loē-iông tī 17 January 2013 hőng khó͘-pih. ↑ 2.0 2.1 "Kuwait". The World Factbook. Central Intelligence Agency. 10 April 2015. ↑ 3.0 3.1 3.2 3.3 "IMF Report for Selected Countries and Subjects : Kuwait". International Monetary Fund. 2 May 2015 khòaⁿ--ê.
Chit ia̍h siāng bóe tī 2019-nî 1-goe̍h 6-ji̍t (Lé-pài), 17:05 ū pian-chi̍p--koè.